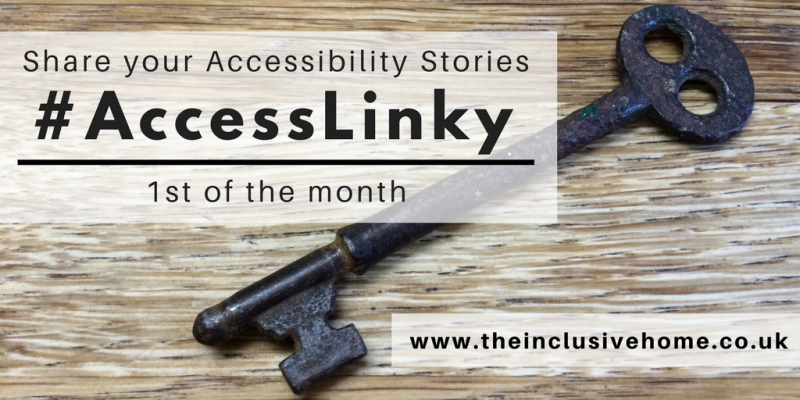 Welcome to the first #AccessLinky round up of 2019! Quite a quiet start but that means I have time to give a little run down of all the posts added last time! There’s a lot of negativity about screen time and tech in the media but we mustn’t forget the good! And the fact that innovation for the mainstream can provide adaptations that enable disabled and neurodiverse people! Rainbows Are Too Beautiful discusses the benefits technology brings to her family in her post: Could my kids use of technology help them when they are older? Which brings me on to Wheelscapades frustrations about Booking Accessible Tickets for gigs and performances! In this age of technology why does it have to be made so much harder than booking regular tickets online!? And (fellow designers!) why are seating layouts not designed so that disabled people can actually sit with their F&F? And finally Ordinary Hopes asks What is this Ideal World? that everyone seems to think is too much to expect? My first #AccessLinky wildcard is “Housing for the Disabled”, a film from the early 1980s looking at emerging best practice ideas for accessible housing. This is part of a free collection of films available on BFI, illustrating how disability has been documented in the UK throughout TV/film history: Disabled Britain on Film An amazing collection that I’ve just begun to explore. Thank you so much to @findlayequality (who was involved in the curation of the collection) for flagging this up to me! This is a very relaxed link-up and I want it to be as open a discussion as possible about access and inclusion! It’s not just for posts about wheels and ramps (although they are of course welcome! ), the linky is open to posts on all aspects of access! Including physical, sensory or social access and inclusion in relation to buildings, products, places, events or activities! It’s easy to link up at the bottom of the post following the InLinkz directions, but do give me a shout if you have any problems! On the first of the month when the next linky is comes out I will include a round up of posts added to the linky from the previous month. Depending on the number of posts added I may select a few favourites to focus on, or (if I can’t choose!) I may summarise more of them. I will also add a wildcard to the round up! A particularly interesting blog I may have come across in that month that hasn’t been linked up! I would love to hear your suggestions on this too if you read anything that stands out to you! This linky is all about information exchange so I want to encourage interaction, but if you find commenting on posts or adding the badge tricky, there’s no pressure to do so. It would also be amazing if you could share your post and/or any others you find interesting (using the hashtag #AccessLinky) on social media to help spread awareness of the issues around accessibility! I’ll also try to retweet as many posts as I can! I welcome input from anyone that is affected by accessible design: disabled people, carers, friends and family as well as designers, developers, managers and legislators (so pretty much everyone!). I also welome blogs from professionals and suppliers, as well as individual bloggers, so long as they keep within the spirit of idea exchange and are not sales posts for products or services. I write about accessible travel as a wheelchair user, city guides, hotel reviews, top tips and the odd personal post. Fantastic! Thank you for linking up!